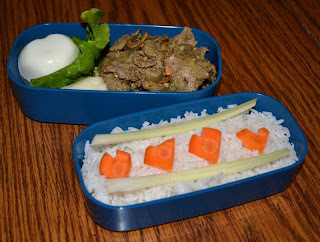 Dandylyon's Blog: Let's Go Bento! I'm going to be covering Japan this weekend in the Cooking Around the World Class I'm doing out at UTA. 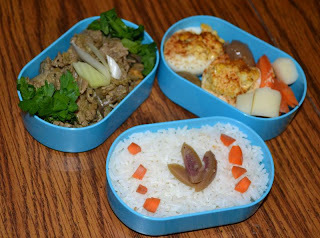 To get in the mood, I made bentos (Japanese-style boxed lunches) for me and the hubby for lunch tomorrow. They're nothing spectacular. Jake's has a heart theme going on, with a heart shaped egg and carrot hearts (inspired by the way the carrot was starting to split on its own) . I'm not much for plain boiled eggs, so I put deviled ones in mine (yes, I know, they were invented by the Romans, but they're colorful and fit with the art side of the bento tradition). When you stack a bento lunch box, the rice always goes on the bottom, meat and cooked or pickled veggies in the middle and (if the box has a third layer), you can use it to add fruit, greens or extras. Bentos served at restaurants often come in single-level square boxes. and may come with tempura or soup. In Japan, you can even get them pre-packed at convienance stores.